Today the awareness of the importance and effects of probiotics on health is increasing. It is generally accepted that probiotics are the “good bacteria” and the official definition is that probiotics are live microorganisms with a beneficial effect on the host’s health. They are found in different parts of our body (digestive, respiratory, urogenital system), and any imbalance related to them can deteriorate the health of the entire system. The best known “good bacteria” habitat is the digestive system and the human gastrointestinal tract which contains around 10(14) bacteria or the amount of 1-2 kg. The bowel is a very important immunological organ which is not able to perform its significant function in case pathogenic (harmful) microorganisms prevail within it. It can result in numerous digestion disorders and illnesses, autoimmune and allergy-based diseases and tumour growth. There are more and more confirmations of the probiotics’ protective role (especially LGG and BB12) of the stomach mucus in patients taking drugs with an anti-inflammatory and analgetic effects (non-steroidal anti-rheumatic drugs, acetylsalicylic acid). Over the past years the possible role of continuously administering probiotics in reducing carcinoma, especially in the colon but also elsewhere, has been intensely researched. However, we must be aware that the described benefits of administering probiotics will be presented only if a quality strain is selected, with a targeted effect on the problems concerned. It is also important to known that not every probiotic is the same, that different strains have different effects and that, during selection, the strain whose efficiency has been proven through clinical studies must be chosen, in prescribed amounts. Strains for probiotic use, according to a scientifically acknowledged strategy, must comply with a large number of requirements, from general ones for resistance to a low pH value, gastric acid, pancreas acid and bile acid, to highly demanding technological and functional criteria. Probiotic strains must survive and maintain the activity during preparation and storage, they must have a proven ability of adhesion to the epithelium, antimicrobial effect, especially towards pathogen microorganisms, they must stimulate immunological response, change the microbial metabolism in the digestion tract and they, by all means, have to be safe. Probiotics present on the market must, in accordance with the regulations, be produced pursuant to the Good Manufacturing Practice (GMP), with defined quality parameters and a defined validity period. According to the WHO guide, the probiotic strain (genus, species) must be identified, safety (in vitro, clinical phase I), functional features (in vitro and on animals) and clinical efficiency (phase II of clinical research – double-blind, placebo controlled, randomized study) assessed, the efficiency must be compared to the standard treatment methods (phase III) and the labelling must be defined (content, minimum number, storage conditions, consumer information). A probiotic strain can be considered safe and effective only when it meets all of these requirements. It is recommended for diarrhoea and dehydration, for taking antibiotics, for treating certain gastrointestinal diseases, for the prevention and treatment of atopic diseases, and for swelling and poor digestion. In the late 90s, JGL already recognized the importance of pharmaceutical products with probiotics in the conservation of good health, and its long-standing experience and knowledge has infused the JGL probiotic family. Each JGL probiotic is distinguished by carefully selected strains, clinical evidence of efficacy and safety, and forms suitable for children and adults. Additionally, JGL protected the packaging of each of its probiotics with a special infrared code, thus ensuring the authenticity and originality of the products on all markets – the first to do so in Croatia and among the first in the world. Today, JGL takes the lead in the entire segment of pharmaceutically formed probiotics in most countries of South-East Europe and the unprecedented leading position in the probiotic segment designed to protect vaginal microflora. Our probiotic work continues and we are expecting new members of the JGL probiotic family in the near future. 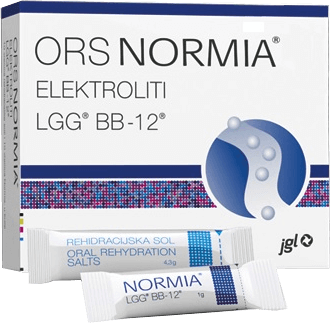 Normia ORS is a unique product that first united LGB and BB-12 probiotic and electrolytic bags, thus securing a double effect - the restoration of intestinal microflora and rehydration. The product is intended for dietary nutrition of patients who have suffered a loss of electrolytes and water due to diarrhoea, for rehydration, recovery of electrolytes, and restoration of the intestinal flora. It can be used from the earliest infancy age. 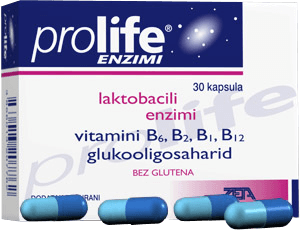 The Prolife enzyme capsules contain a complex of digestive enzymes: amylases, peptides, lipases (facilitating the degradation of carbohydrates, proteins and fats), bacterial cultures of Bacillus coagulans (Lactobacillus sporogenes) and Lactobacillus plantarium R1012, glucooligosaccharides and vitamins: B6 (pyridoxine hydrochloride), B2 (riboﬂavin), B1 (thiamine hydrochloride) and B12 (cyanocobalamin).